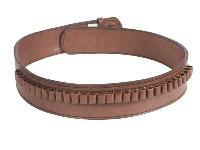 Western Justice Gun Belt, 30-34" Waist, .38-Cal Loops, 2.5" Wide, Chocolate Leather. 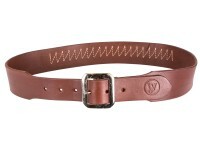 Belts. 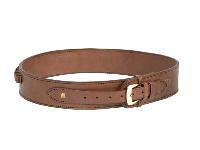 Measure yourself along the high hip at the bottom of your belt loops on your jeans/pants/chaps/hunting gear. 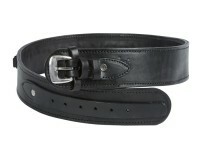 Provide enough inches to buckle your belt at the middle hole of your gun belt. Measure yourself over your usual shooting attire. 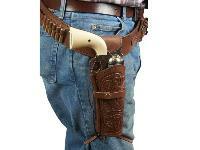 Generally speaking, you'll wear your gun belt on your high hip, with the top of the belt resting near the bottom of the belt loops on your jeans/pants/chaps/hunting gear. 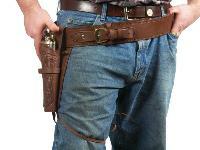 Gun belt sizes are usually 4-6 inches larger than your regular blue jean waist size. 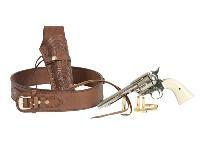 Things I liked: Nice gun belt. Things I would have changed: Smaller size for skinny kids would be nice. 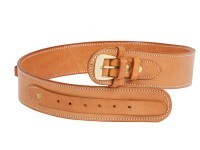 Things I liked: I sent this belt back to exchange for a larger size-next largest, and have not received the belt. As an idiot does, I kept no records, but you guys have been so on the ball that I did not think it necessary. If you could send this in the right direction to expedite this transaction, I'd appreciate it! Things I would have changed: I would start keeping records. 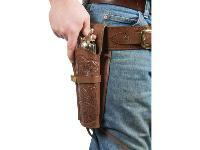 What others should know: It's a great addition to the holster and pistol and I love 'em all! 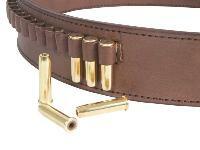 How many bullets can this belt carry? 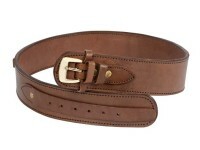 This belt holds 36 bullets.